Dr. Paul Blackman is the Chief Medical Officer for Athletics Australia, a non-profit organisation that serves as the national governing body for athletics in Australia, and that is charged with ensuring adequate representation of Australia in athletics at regional and international athletic games and sporting events. He has also worked as Chief Medical Officer for AFL clubs Collingwood and Melbourne. "As a Sport and Exercise Physician, I've been using point-of-care ultrasound for approximately 15 years. We tend to focus mainly on procedural work, as opposed to diagnostics, because we have good access to very good tertiary care and radiologists with exceptional diagnostic skills. However, we recognised that many of our medium-to-large size joint injections that we usually refer to radiologists, things like shoulder hydrodilatations and hip joint injections, weren't being performed the way we wanted. We decided that we needed to learn the skills and start doing the injections ourselves. 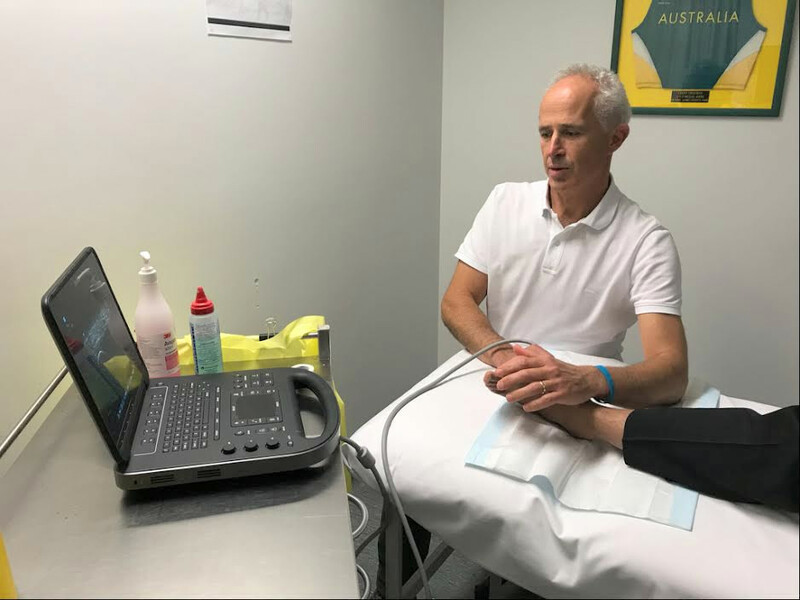 Point-of-care ultrasound became a very useful strategy for more effective, clinically-appropriate treatment with procedures such as joint- and tendon-related injections, and the patient feedback was exceptional. They were very pleased to have us doing it, rather than having to go to another provider. It’s more cost effective for the patient, and a time-saver, since we can sometimes perform injections on the same day. Even if a patient had to return at a later date for their treatment, they were much happier to come back to the same place to see the same provider that they've already developed a relationship with." Diagnosing and treating tendinopathies is a large part of our practice. Any procedural work with tendons, such as paratendon sheath injections or blood product PRP injections, we perform under ultrasound guidance. Only for the most difficult-to-access regions will we refer our patients to the specialist MSK radiologist. It’s been a major benefit to both patients and doctors, with patient feedback indicating a greater level of satisfaction as a result of this shift in treatment strategy." With issues like tendinopathy, I find it convenient to be able to have an ultrasound machine right on hand. For example; a patient with severe tendinopathy I would often see over 2-3 years and if appropriate, I can obtain baseline imaging of the tendon. Then perhaps a year or more down the track if clinically indicated I can have a second look at that tendon - and the patients are very appreciative that it is done in a timely manner again on the same premises. When trackside, if someone has an episode like a tendon or muscle injury, we would use a device like the iViz. It can help us provide an immediate overall assessment at a higher level, making decisions about competitions and continuing training and performance. Identifying pathology is an important adjunct role for this technology. In other sports, like football, the sideline work involves a lot more trauma. Having a point-of-care system can be very valuable in diagnosing particular muscle, tendon, and joint injuries. Occasionally, athletes will have an injection before competition, and ultrasound guidance using a system like the Edge II makes it much more reliable. It gives both physician and patient a sense of comfort and certainty, to be able to know that you have complete control over what and where you are injecting. Ultrasound has been a major benefit to us as Sport and Exercise Physicians and we are delivering a much better outcome for the patient. Patient satisfaction has increased dramatically since we adopted the use of ultrasound for procedures. Before point-of-care ultrasound, we felt comfortable doing blind injections to a number of areas. With larger joints however, I wouldn't feel comfortable doing those blind. I don't think it's appropriate. Even a subacromial injection, or a small joint injection, is much more reliable under ultrasound guidance. You know you're going to get the location right 100% of the time, plus you're also getting simultaneous diagnostic information. There are merits in learning both methods, because they complement each other. Previously, we would have done “blind” injections based on our learning of surface anatomy, and we are conscious of training our registrars in the techniques of both blind injections and using ultrasound guidance. However, we now know that the reliability of a procedure improves with ultrasound guidance. You have to draw the line on the kind of procedure that you feel comfortable doing without ultrasound guidance. We can also often find ourselves practicing medicine at the trackside or field side, hotel room, or in other locations, so portable medical imaging is very handy particularly in elite training environments when travelling all over the world. Therefore, size, weight, and portability have become important factors to consider when looking at particular ultrasound machines."